Many women dream of experiencing the moment when they finally find the wedding dress that makes their heart sing. In TV shows and movies, we commonly see the future bride walking out of the dressing room in her favourite gown, awing the friends and family she's brought with her and bringing them all to happy tears. It's a romantic and memorable moment every bride deserves to have, but like with most things in life, you can't just jump into a wedding dress and declare it as your own. You'll need to think through certain things before heading to the checkout area and making the big purchase. If you're not sure what to ask yourself before buying your dress, read on for some good questions to run through when you've found a dress you love. By asking these questions, you could be saving yourself a lot of time and money in the future, and you won't have to worry about ruining your big wedding dress moment to have a wonderful and smart experience in the store. 1. Will This Gown Be Restricting? Putting a dress on and walking around in it for a few minutes is easy to do with basically any dress the store assistant is going to hand you. However, on your wedding day, you'll be doing a lot more than walking around. There will be sitting, dancing and lots of activities to enjoy, but it'll be hard to have fun if your dress keeps you from sitting or moving around comfortably. If you think you've found your perfect dress, practice sitting down in it and bust out a few dance moves. See how it feels when you do this and note where it's too loose or too tight. You should also consider how intricate it is to put on and take off, if you're planning on doing a quick change or two between different parts of your wedding day. 2. Is It Flattering, or Just Pretty? Wedding dresses are meant to make people's jaws drop, so they're all going to be gorgeous to look at. Once you put on an intricately designed dress, you may fall in love at first sight. Don't get fooled by the beauty of the gown, though. Even the prettiest dress in the world may not be the best match for your shape and frame. Take some time to find the perfect wedding dress for your body type online before going into the dress stores. It'll help you narrow down your dress options with the store assistant and not bother with anything that wouldn't look right on you. 3. What Jewellery Will Match It? White dresses are easy to pair with jewellery, but you may be the bride looking for a subtle colour change or something bold for your dress instead. You don't need to worry about not finding jewellery that's right for your wedding dress, since you can highlight your look with exclusive designs. Colours like ivory will look best with gold and diamond jewellery, while you can offset bright colours with a mix of classy pearls or diamonds set in platinum. See if the store has any samples you can hold up against your dress to judge what will go with it before you ever take your dress home. Wedding dresses range from moderately expensive to extensively so, but there's a reason for it. Not only are dresses going to cost more when they come from well-known designers who use quality materials, but the overall cost could include other things like steaming and alterations. Talk with your designer or store contact to see what the cost of your dress includes, and if they'll add any freebies into the final price. 5. Will It Span Decades? There's a tradition that after a bride gets married, she stores her wedding dress in pristine condition so her future daughters can alter it and wear it when their weddings happen. While this tradition isn't for everyone, if it interests you, try to choose a dress that will be timeless, instead of fitting with the fashion trends of one specific era. It'll help the dress span decades, so it doesn't look very outdated if your daughters ever want to use it as their own. 6. Is There a Sample? When you get to a wedding dress store and try on what they have, they won't have different sizes in each dress. Instead, they'll send away for your size, and once it arrives, you'll need to get it fitted. It's a much longer process than your average shopping trip, which adds to the final price. Don't be afraid to ask your designer or store associate if there's a sample dress available at the store. Sample gowns will still need alterations, but they'll come at a discounted price. They're what other brides have tried on in the past, so there may be a bit of wear in them, but with a cleaning, they'll look brand-new. Because wedding dresses get altered specifically for each bride they go home with, most bridal shops don't accept returns or refunds. It's still smart to check with your bridal shop just in case, but expect that once you make the purchase, it's final. You may be able to resell the dress on your own if the alterations haven't happened yet, but otherwise, the dress you buy is the one you'll have to keep. 8. What Is the Payment Plan? Depending on where you buy your dress and what the overall cost is, there may be a couple of payment plans from you to choose from. Typically, you'll be able to pay off your dress over two to six payments, but you'll need to arrange that with your specific dress provider and what they normally offer clients. 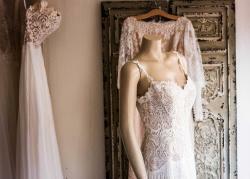 Buying your wedding dress is an exciting decision, and you shouldn't make it lightly. You're going to be looking for a gut feeling to point you to the right dress, but you should still inquire about things like payment plans and possible discounts to make your dress-buying experience the dream it should be.